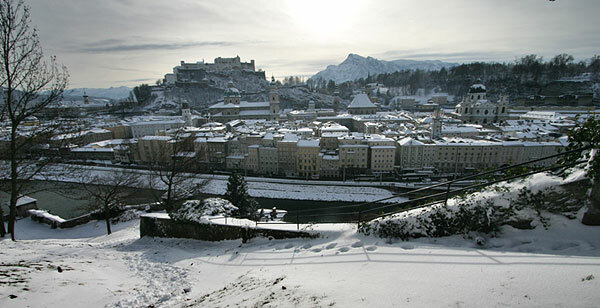 Even bleak winter days cannot do any serious harm to the beauty of Salzburg. Whilst this picture, taken in December, evokes the idea that Salzburg is an empty place during winter, this is not the case at all. Just the opposite is true: The Christmas Market draws thousands of visitors from all over Central Europe, the UK, the US, Asia and other parts of the world in the weeks from late November to Christmas; at New Year's Eve, especially Italians love Salzburg; and right afterwards, Russians come to Salzburg for the Russian Christmas and skiing holidays in the southern districts of Salzburg, followed by other skiing tourists from all over the world. This makes Salzburg and the skiing areas in the south a year-round destination with two high-seasons, one in summer, the other in winter. Only in between these peaks, bargain offers can be found in hotels.